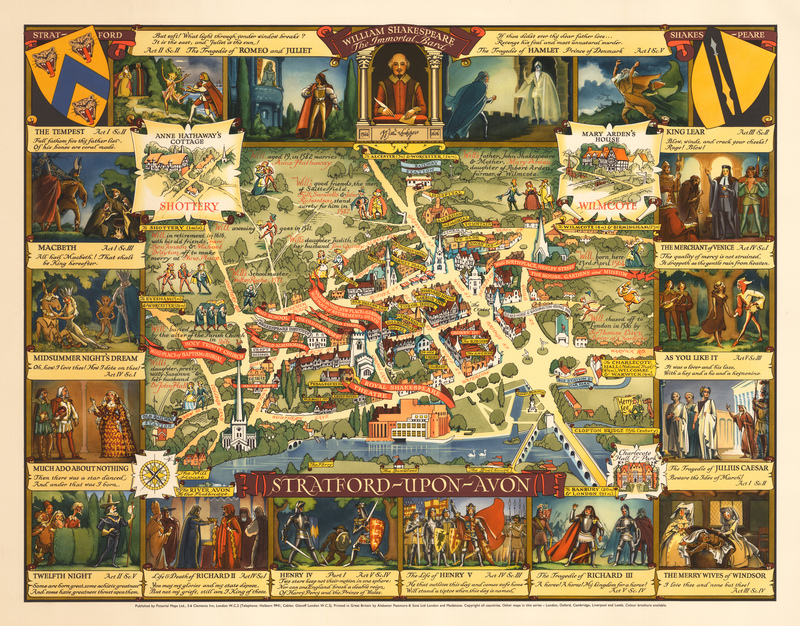 This marvelous mid-twentieth-century pictorial map of Stratford-upon-Avon, the birthplace of the Immortal Bard William Shakespeare, provides a bird’s eye view of the small city and the places in it which are associated with the Bard. The map, designed and drawn by Sorbonne-educated Kerry Ernest Lee, is richly adorned with places of interest, and events related to the Great Bard’s life. Accomplished with a light and humorous touch, the map contains numerous vignettes with beautifully illustrated scenes from Shakespeare’s plays, and serves as a perfect visitor’s guide to the historical center of the city, with separate houses drawn in detail. The top left corner contains the coat of arms of Stratford, a chevron azure between three leopard’s heads gules, while the top right corner holds the coat of arms of the Shakespeare family — a bend sable, a spear of the first, steeled argent – a gold spear tipped with silver, on a black diagonal bar over a gold shield. A vignette with Shakespeare’s portrait and signature is centrally placed at the top of the map, surrounded by quotes from ‘Romeo and Juliet’ and ‘Hamlet’. Notes on his life from birth through old age and death, and the lives of immediate family members fill the map, at once informative and jocular. All landmarks both historical and modern are depicted. The map is a fine pictorial record of the city. Condition: This pictorial map is in A condition.